Thanks for the insight PB! 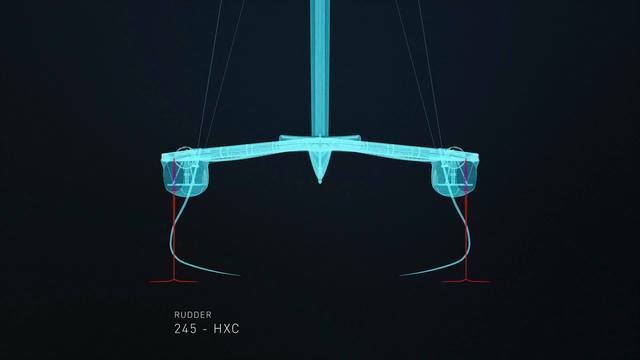 SailGP’s new F50 wingsailed catamaran will be an incredible high performance racing machine. The F50 is predicted to break the 50 knot barrier as the most challenging, high-tech one-design racing boat ever produced. 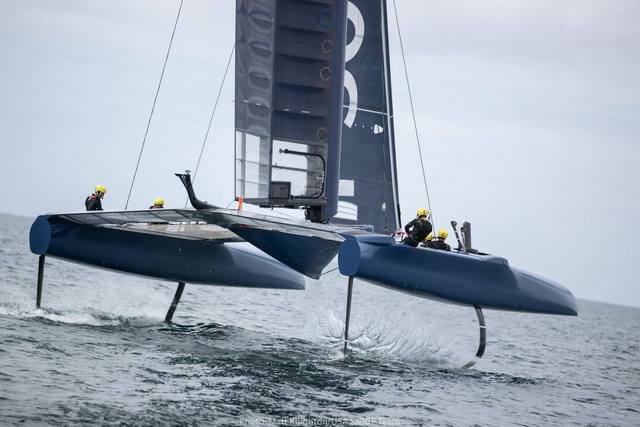 At a glance, one could be forgiven for thinking it looks familiar to the AC50 used at the last America’s Cup in Bermuda. But in reality, there is a huge difference in performance between the two classes. These boats have been redesigned, re-engineered and rebuilt from the inside out. Take, for example, flight control. This is the command and control system so vital to maintaining stable flight to keep the boat sailing at pace. And here the F50 designers have really gone to work. 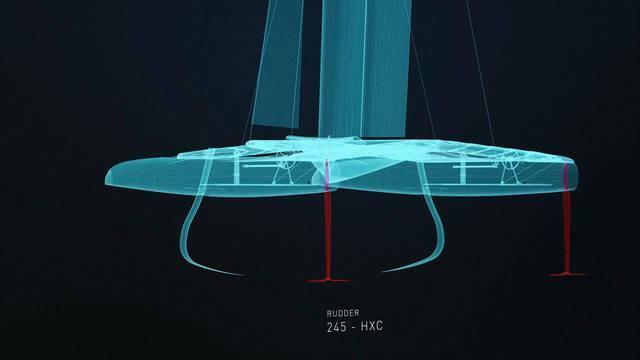 For the F50 both the foil and rudder pitch will be actively controlled. This should make the flight of the boat through the manoeuvres significantly more efficient. The foils have been produced in higher modulus carbon fibre, producing a thinner section which has less resistance at high boat speeds. 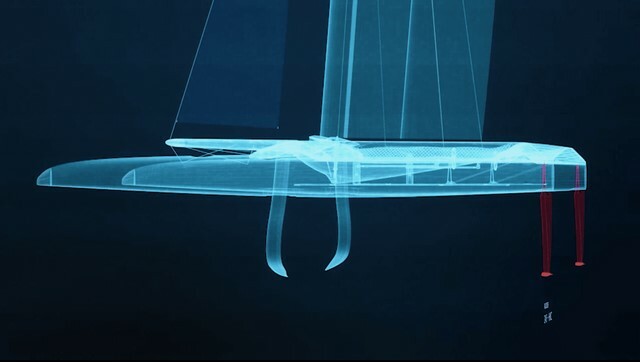 The geometry of the boards has been extended outside the maximum beam of the boat which provides more righting moment and a smoother transition between the vertical and horizontal sections of the foil. All of this translates into significantly higher ultimate boat speeds, where the onset of cavitation on the board occurs at a much higher speed as compared to a foil designed under the AC50 class rule. Batteries have been brought in and are connected to a new hydraulic accumulator to power the foil and rudder pitch control, the jib sheet, and the wing twist control freeing up the two grinders to work on providing power to the wing sheet. The flight of the boat can be controlled from the twist grips on the steering wheel or from a joystick controlled by the crew member sitting in position 3 (flight controller). The ride height of the boat can be adjusted independent of the fore and aft bow down pitch. What seems like miles of hydraulic lines stitched inside the hulls and under the floorboards are used to distribute power to cant the boards to the most efficient angle and activate the rudder pitch control system. The helmsman can control the ride height, the jib sheet, and the rudder differential from push buttons on the steering wheel. The helmsman can also adjust the speed at which those functions are adjusted by adjusting a dial in the centre of the steering wheel. Teamwork and communication will be key to achieving speed and efficiency. Top speeds are expected to be 53 knots when the boat is reaching in 20 knots of wind speed. The onset of cavitation is predicted to occur at approximately 48 knots of boat speed – a process where high speed causes the water to bubble near the foil, reducing lift and ultimately limiting the ability to fly the boat efficiently once the cavitation becomes excessive. With battery power on board the teams will have more freedom to tack or gybe more frequently. Skippers and tacticians won’t find themselves waiting for grinders to build power in the system before they can call for the next maneuver. The F50s will sail with just five crew, the batteries freeing up one grinding position on board. This has led to a complete redesign of the cockpit layout. Six F50s will be on the water for the first event in Sydney, Australia in February 2019. Three have been extensively modified using parts from parts of the previous AC50 models. Three sets of the F50s hulls are complete new builds. All of the work was done at Core Builders Composites in New Zealand. These boats will start life – and remain completely – one-design. But crucially, unlike nearly every previous one-design class, the F50 is an active development class. The shared design team will continuously research and implement innovations to ensure that the F50 class remains at the cutting edge. Where new components are introduced the will be applied equally across the fleet. The boats will be identical in every respect apart from the crew who sail them and the colors on the livery. 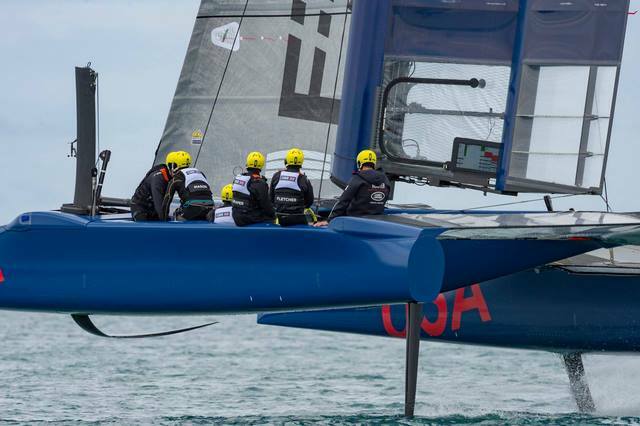 SailGP has employed veteran designer Mike Drummond to lead the design effort, and he’s supported by some of the most respected names in foil and aerodynamic design, including Hal Youngren and Tom Speers. 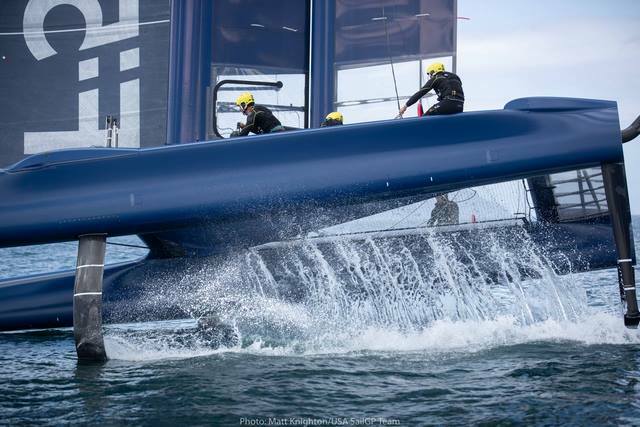 The hydraulic and electrical control systems and software are being developed and improved at Artemis Technologies, where former America’s Cup skipper and Olympic medalist Iain Percy manages the team.. The next area of development will be with the wingsails, where the second-generation wings are expected to be modular set-ups that will allow the teams to use different size wings in different conditions, thus broadening the wind range that the boats can effectively race. It is expected that there will be three different sizes of wing span, 18m, 24m and 28m. 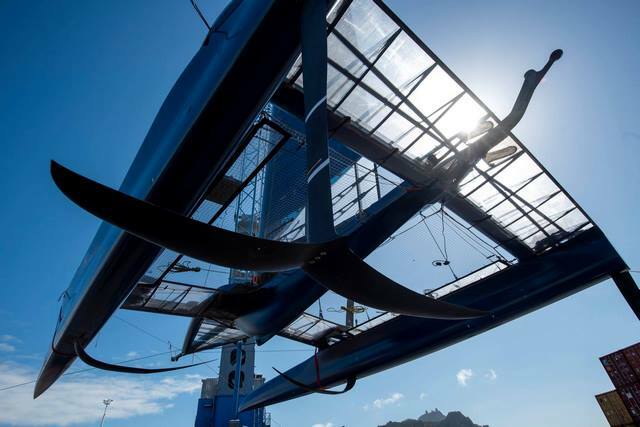 The first heavy-weather wings could be ready for testing as early as the event in Cowes, and could conceivably be used for the final event in Marseille. But this is just the tip of the iceberg. The F50 will launch as the fastest, most exciting one-design racing class in the world and the development pipeline will likely keep it there for years to come. The F50 catamaran: speed, reimagined. The United States SailGP Team and the China SailGP Team were lucky enough to be the first to get time on the water in the F50. The teams are wrapping up an intensive two week session in New Zealand getting a feel for these racing machines. Full report coming soon! The Japan SailGP Team, from L to R: Iain Jensen, Leo Takahashi, Yugo Yoshida, Nathan Outteridge, Yuki Kasatani and Luke Parkinson. 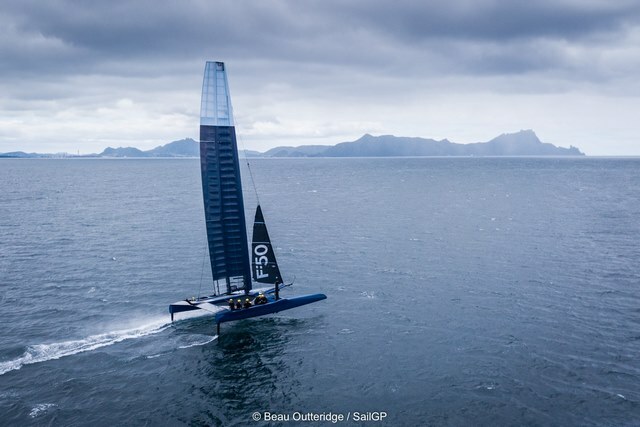 SailGP today introduced the sixth and final team for season one of its new global racing league, the Japan SailGP Team – a world-class crew combining three of Japan’s most talented sailors with three international foiling catamaran veterans. The Japan SailGP Team’s blend of youth and experience will allow the crew to challenge in season one, and set the standard for the next generation of aspiring Japanese sailors. 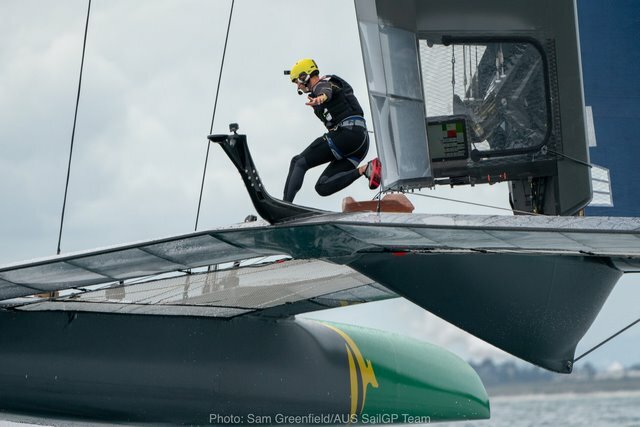 Two-time Olympic medalist and America’s Cup veteran Nathan Outteridge – one of the world’s most talented and experienced high-performance foiling sailors – leads the Japan SailGP Team as CEO/helm. He is joined by the Japanese trio of Yugo Yoshida, Yuki Kasatani and Leo Takahashi, who will all serve in the grinder role in season one. Yoshida represented Japan in the 470 class at the Olympic Games London 2012 and several world championships. 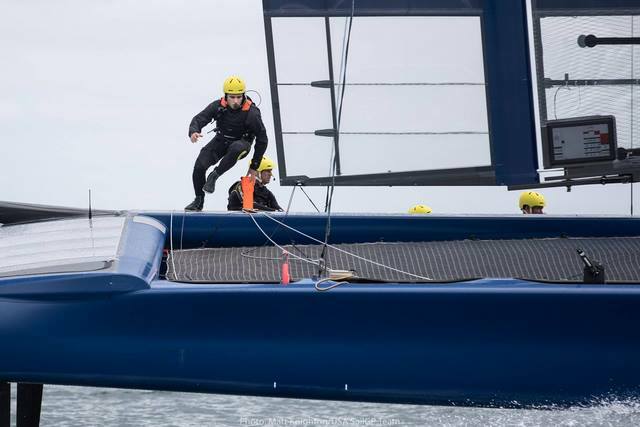 He made his high-performance foiling catamaran debut with SoftBank Team Japan at the 2017 America’s Cup in Bermuda, alongside SailGP teammate Kasatani – a former national-level rowing champion. Meanwhile, 19-year old Takahashi is the youngest athlete in SailGP. He has been a member of the Japan National Team since 2015 and was part of Japan’s 2017 Youth America’s Cup effort. 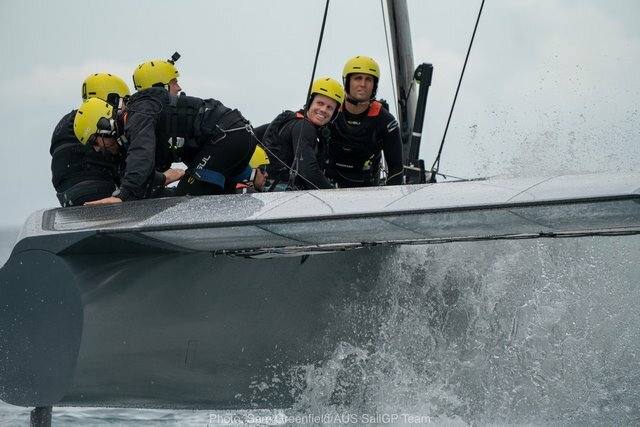 Outteridge’s Olympic- and world-title winning Australia teammate Iain Jensen and another fellow Australian, Volvo Ocean Race winner Luke Parkinson, round out the six-man roster. 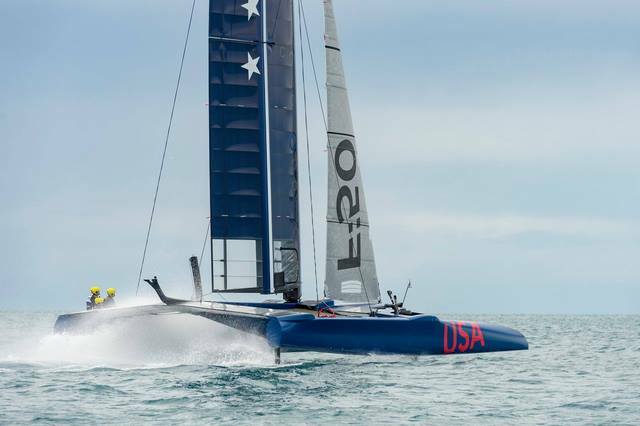 The trio all sailed together with Artemis Racing for the 2017 America’s Cup. 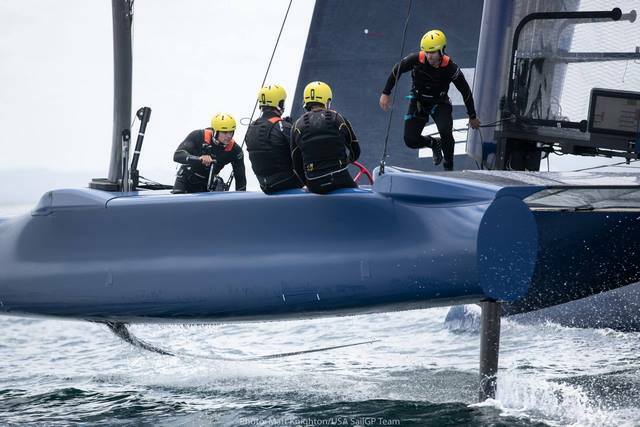 Established in 2018 by Larry Ellison and Russell Coutts, SailGP is an innovative fresh approach to a history-rich sport, aiming to increase mainstream popularity and excite sailing’s next generation. In its first season, the fan-centric league will bring intense inshore racing to Sydney; San Francisco; New York; Cowes, U.K.; and Marseille, France, as world-class crews compete for the championship trophy and a US$1 million prize. 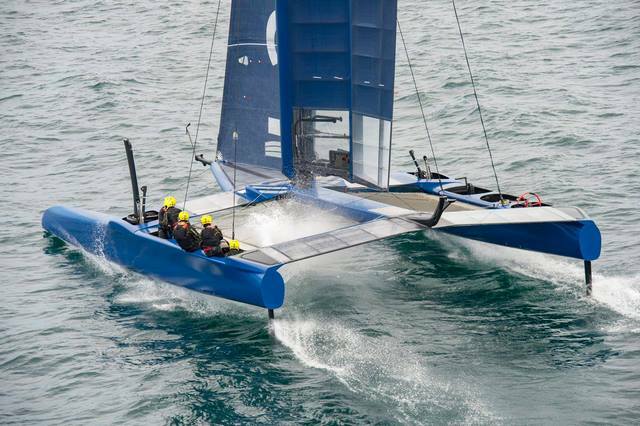 The teams will race identical wingsailed F50s – enhanced foiling catamarans capable of breaking the 50-knot barrier. 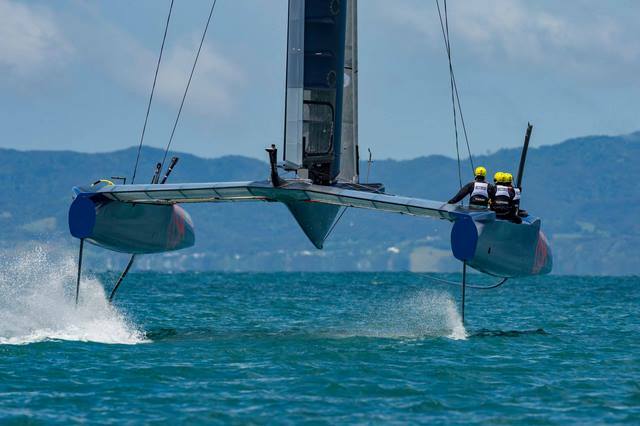 SailGP and World Sailing rules designate Japan as a developing country, allowing the team to select a specified number of non-native athletes to participate with the national team so it can safely pilot the demanding F50 yachts from the very first race. The Japan SailGP Team has a 40 percent nationality requirement for season one, which will increase during the team’s initial years of racing. Eventually, every national team will be fully comprised of athletes native to the country, sharpening the nation-versus-nation edge that sets SailGP apart from many other top-class sailing competitions. 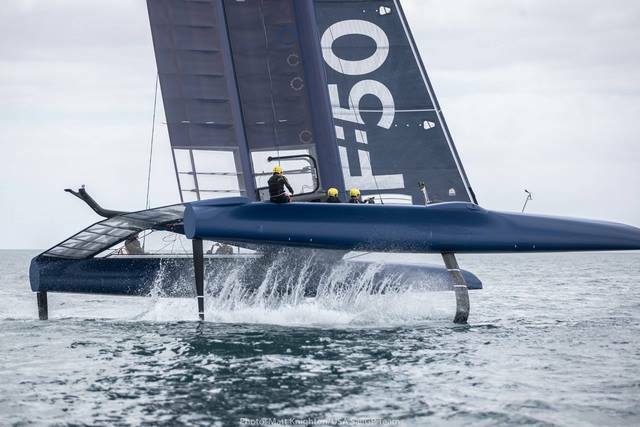 In November 2018 the Chinese and American teams were the first two SailGP teams to get training time on the F50, the supercharged foiling catamaran that they will race next year. They sailed out of the Northpoint facility in New Zealand's stunning Northland region. 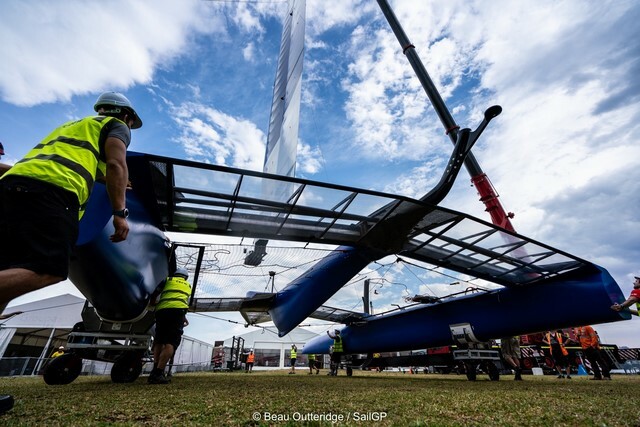 The four remaining teams will have their chance over the following weeks, before the boats are shipped to Sydney for the inaugural SailGP event 15-16 February, 2019. 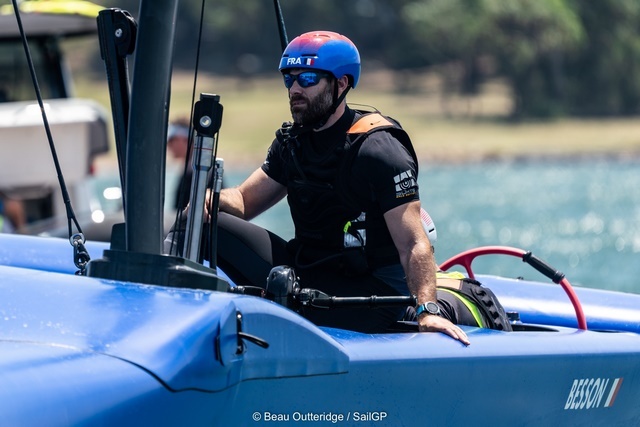 The Great Britain SailGP Team has been making the most of every opportunity to get out on the water during their time in New Zealand, despite challenging weather conditions. 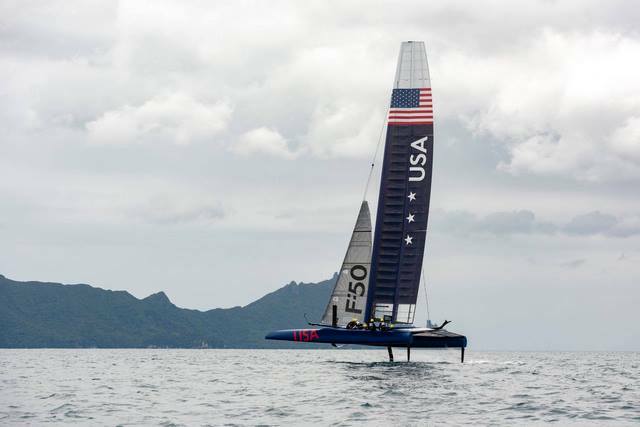 Shown here training in the F50 borrowed from United States SailGP Team. 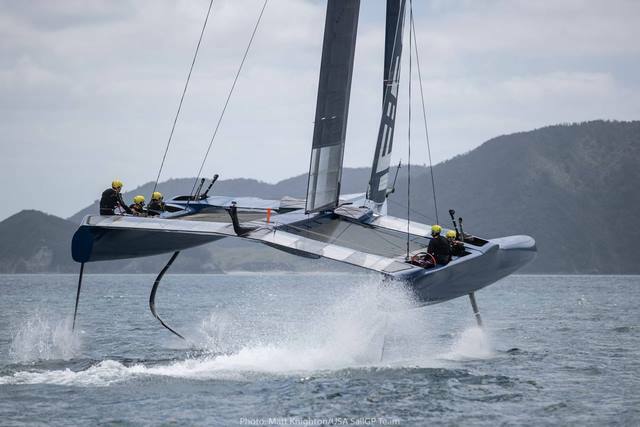 Australia’s SailGP Team boat has been revealed for the first time today as the crew, led by skipper and Olympic gold medallist Tom Slingsby, tests the revolutionary new F50 off the coast of New Zealand’s Northland region. 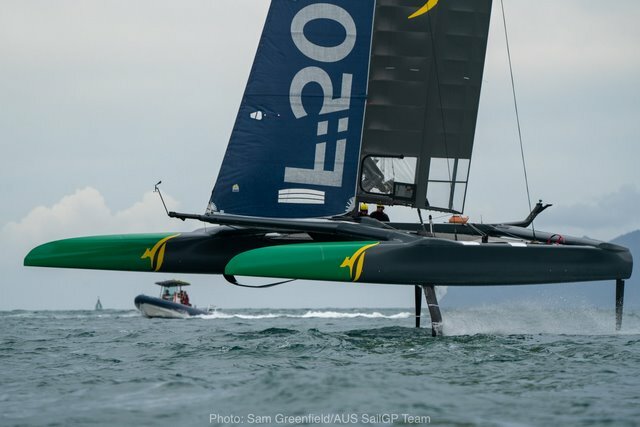 Emblazoned with a giant kangaroo, Australia flag, and green and gold paint, the team’s F50 wing-sailed catamaran hit the water for the first time this week, with the crew testing the boat’s safety, control systems, speed and maneuverability. 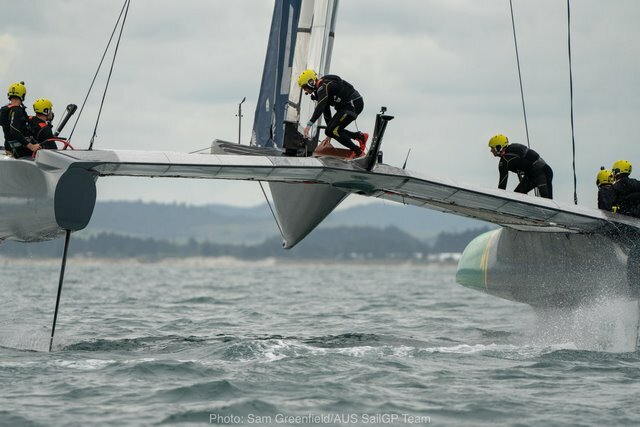 Slingsby, who won the America’s Cup with the U.S. entry in 2013, also had a hand in designing the artwork used on the Australian team’s F50, which can reach speeds of over 50 knots (100kph). The base will also feature a free public viewing area situated on top of the island’s cliff, providing a family-friendly opportunity for fans to oversee the operation, and watch the technical process of getting the massive F50 catamarans prepped and launched into Sydney Harbour for training and racing. 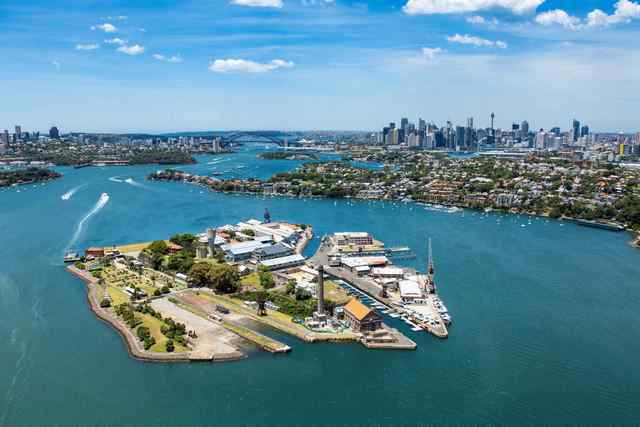 Cockatoo Island will also offer the rare opportunity for fans to get behind the scenes by touring the team bases in the lead up to the inaugural SailGP Grand Prix. The free tours will give fans an inside look at the cutting-edge technology of the F50 catamarans and a behind-the-scenes look at how the team bases operate. Tours will be available on selected dates from 1 February 2019 and can be booked here. Tickets are now on sale for the SailGP Sydney Grand Prix, 15-16 February 2019 on Sydney Harbour. For tickets and further details click here. 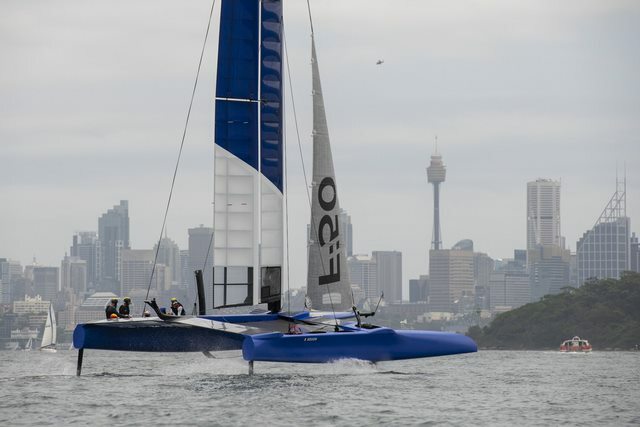 The all-new SailGP international circuit gets under way in Sydney, where the inaugural regattas will be held on February 15th and 16th. After that of the Australian team, it is that of the French team that has been unveiled in its new design. With a dress adorned essentially with blue, the F50 will carry high the colors of France and its team. This symbolic first stage of launching in the port of Sydney concretizes the beginning of a new sailing and competitive era that will make sense in 3 weeks. The countdown begins ! 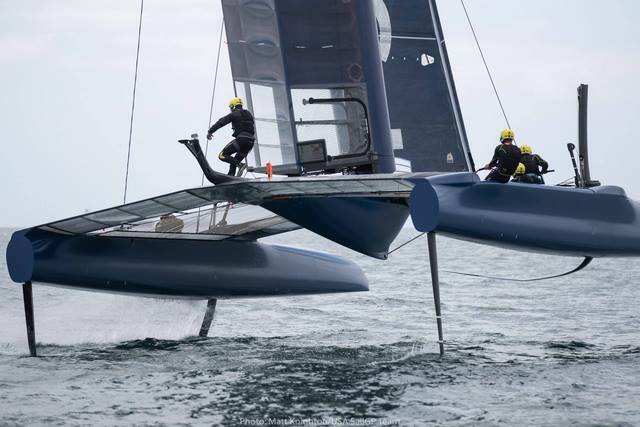 Meanwhile, ride, develop the F50 monotypes, learn to tame, then aim for performance, this is what already occupies the French Team SailGP Billy Besson. 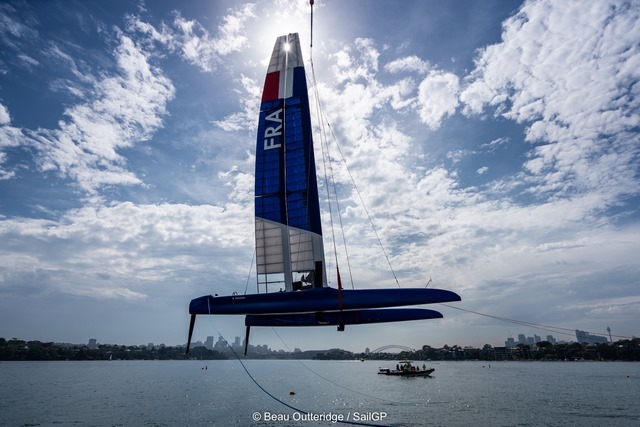 There, in Sydney, France SailGP Team's technical team has been hard at work for a few days to assemble, prepare, adjust and fine-tune its F50 so that everything is ready when Billy Besson and Marie Riou arrive on site. Sunday. On the shores of Sydney Harbor, Yoann Bibeau and the technical team are not idle. The boat captain of the French Team is not the main person in charge of the assembly of the boat, since the load returns to the technical team of the SailGP circuit, but it assists and ensures the smooth running of the operations. "The assembly takes time, especially for the installation of electronic and hydraulic systems, especially since there is not one, but six boats to put in working order, and that the monotype imposes a constant watch on equal adjustments. It's good if they allow the boat to perform well, but the priority is for all teams to be on an equal footing. " During this period of "sea trials" each boat will be tested by a rotating crew composed of sailors from all teams. 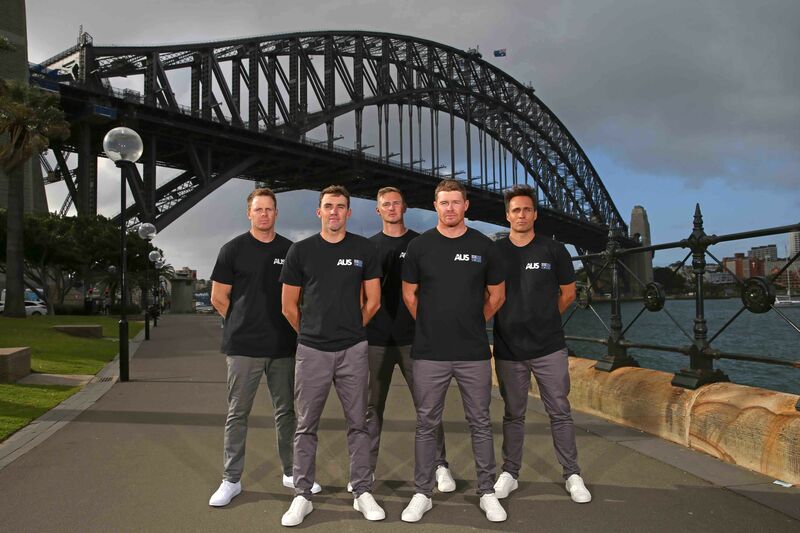 When Billy Besson, Marie Riou and their teammates land their barda in Sydney Bay on Sunday, they will be invited to join the test team led by Australian skipper Tom Slingsby. Only once this test period is over will the three weeks of training begin, with the first duels on February 1st. "It's a beautiful page ahead," says Billy Besson from Portugal where, until this weekend, he is in Olympic training with Marie Riou. "I'm very excited to get into the thick of things, especially since there's a lot of work to be done to get ready for the 14 February warm-up and the two-day regatta on 15 and 16. February ". It is therefore aboard the catamaran "blue" that we will meet the flight crew tricolor in a few days. Like the Blue, symbol of truth and trust, the team led by Billy Besson and Marie Riou will participate in the writing of a new chapter in the history of world sailing. 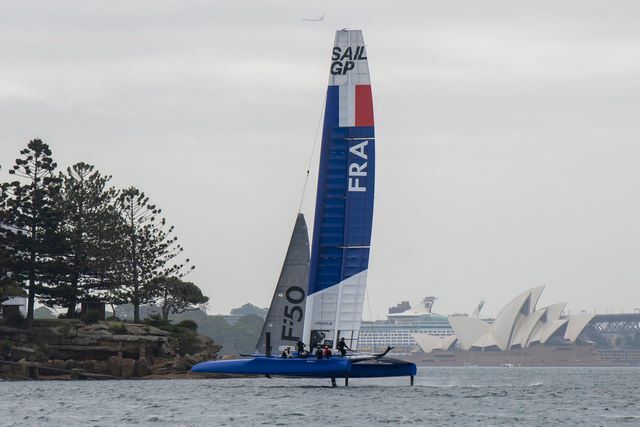 With just three weeks to go before SailGP’s international debut, the France SailGP Team today unveiled its boat on Sydney Harbour. 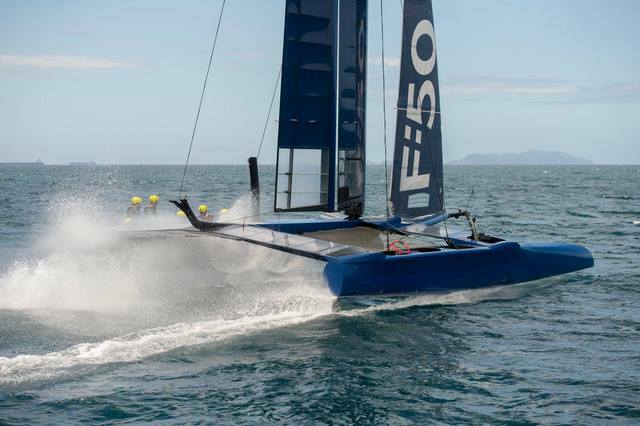 The new F50 catamaran is the world’s fastest and most technologically advanced race boat, and will feature prominently in SailGP, a global racing championship premiering in Sydney on 15 and 16 February. San Francisco is home to one of the most stunning and iconic bays in the world. A natural amphitheater, the Bay Area offers vantage points all along the city shoreline. One of the most visited cities in the United States, San Francisco offers outstanding hotels, restaurants and tourist attractions to enjoy around a weekend of incredible sailing. 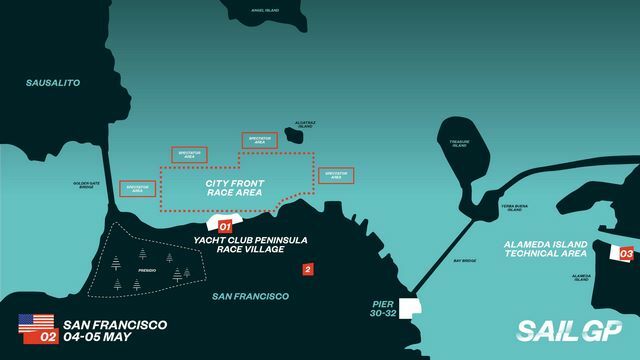 San Francisco SailGP will take place on May 4-5, 2019, on a city front racecourse, with the Race Village located on the Marina Yacht Club Peninsula. Saturday and Sunday racing will run from 12-2 p.m. with opportunities to watch from both the water and the shore. Fans can register to receive exclusive updates on unique experiences for San Francisco SailGP, including access to ticketing information and presales plus other event details. Ticket options include exciting shoreside and on-water opportunities. SailGP also offers a complimentary registration program for fans wishing to watch the action from the comfort of their own boat. Registrants will receive important race management information, including detailed schedules, spectator zones, access restrictions and the latest race maps. 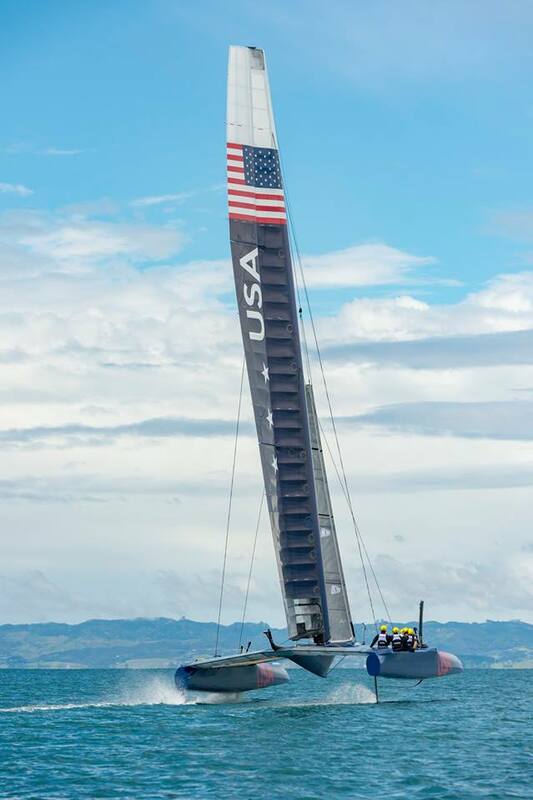 In addition, participants in the Boater Program will receive a commemorative San Francisco SailGP boat flag and will be entered for a chance to win a VIP tour of the United States SailGP Team base.